The Cisco Catalyst 4948 Switch is a wire-speed, low-latency, Layer 2-4, 1-rack-unit (1 RU) fixed-configuration switch for rack-optimized server switching. Based on the proven Cisco Catalyst 4500 Series hardware and software architecture, the Cisco Catalyst 4948 Switch Series offers exceptional performance and reliability for low density, multilayer aggregation of high performance servers and workstations. The Cisco Catalyst 4948 Switch offers 48 ports of wire-speed 10/100/1000BASE-T with 4 alternative wired ports that can accommodate optional 1000BASE-X Small Form-Factor Pluggable (SFP) optics. Exceptional reliability and serviceability are delivered with optional internal AC or DC 1 + 1 hot-swappable power supplies and a hot-swappable fan tray with redundant fans. 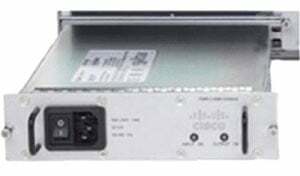 The Cisco PWR-C49E-300AC-R= is also known as CSC-PWRC49E300ACR=	or PWRC49E300ACR=	.